Melt 1/3 of the sugar on low heat until melted. Add another the next third and then the final third mixing all the while and stirring continuously. Do not allow the mixture to burn. Once all the sugar has dissolved, add the butter and continue to stir (expect it to bubble and froth) Warm the cream in the microwave while this is happening and pour it into the sugar mixture and stir until smooth. Beat the thickened cream until soft peaks form. Then add about ¾ of the caramel mixture (Or to taste) and beat again until stiffer peaks form. Set in the fridge for 4 hours or overnight before piping into shot glasses. Heat the 150ml of thickened cream until just below boiling point, then add the cream to a bowl filled with the crushed dark chocolate and mix vigorously. In a separate bowl beat the egg whites until soft peaks form and gradually add sugar beating well after each addition. Fold the egg white mixture through the chocolate mixture in 3 lots. Whip the extra cream until soft peaks form, fold cream through the chocolate mixture. Refrigerate 4 hours or overnight before piping into shot glasses. 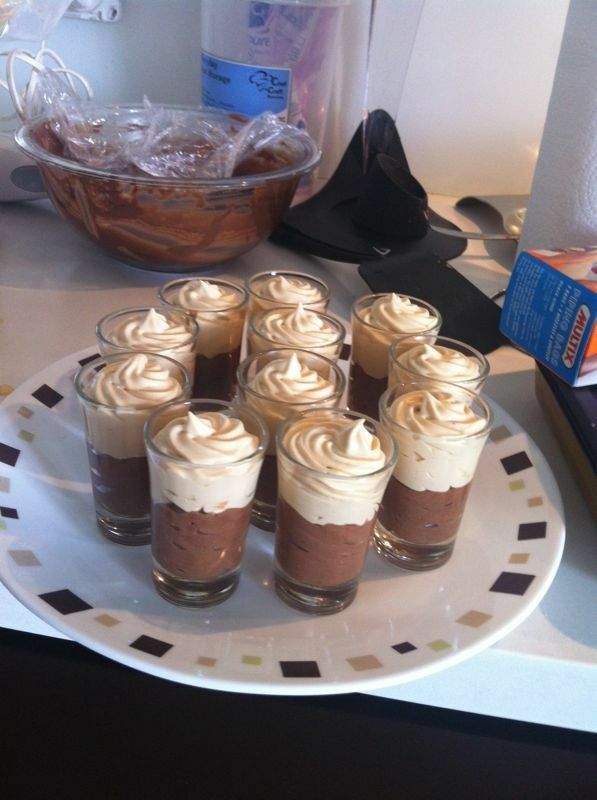 Pipe alternating layers of the chocolate and caramel mousse into shot or other glasses. Although it is fun to taste each mousse on its own, suggest to your guests that they try a spoonful with both mousses to get the full “party in your mouth” effect. This entry was posted in Desserts and tagged Caramel, Chocolate, chocolate mousse, cooks, cream, desserts, mousse, salted caramel, shot glasses, thickened cream. Bookmark the permalink.